Your home’s sewage system is probably not something that remains top of mind in the day to day. In fact, most homeowners would rather not think about it at all. But what happens when you are confronted with raw sewage in your home or yard? The devastating repercussions should be enough incentive for you to do a bit of research into the matter. Fortunately, the professionals at RestoPros have experience in dealing with a variety of water and sewage damage concerns. They have detailed the most important facts in case it happens to you. There are a few reasons why raw sewage might flood your home. Backflow from your system, clogged or damaged plumbing, or sceptic tank issues can result in a sewage leak. In addition to expensive structural damage, the health issues that can result from exposure are myriad. Raw sewage contains harmful microorganisms that can spread parasites, viruses and deadly bacteria. Exposure to humans and animals can result in illness, some of which can prove fatal. When you notice a sewage leak inside your home, make sure that children and pets are evacuated immediately (or kept far away from the affected area). 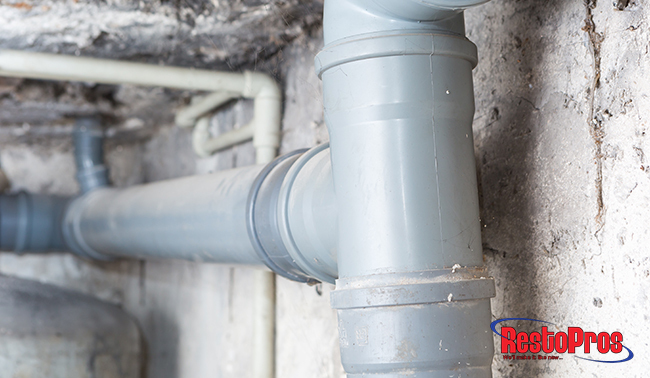 You will know the difference from a typical plumbing leak immediately – either by the smell or the dark color. Turn off the electrical power in your home (if this can be done safely). If possible, turn off the water supply to your home. Make sure that you also turn off any running water – and do not drink any water from your plumbing system. Contact your local sewage department or municipal authority. Request emergency services in Dallas. Wear protective equipment such as rubber gloves, protective eyewear and rubber boots before securing the affected area. This includes removing any electrical equipment and furniture that was not directly contaminated by the leak. Add some chlorine bleach to any areas containing standing water. This will help a bit with disinfection. Be proactive about cross contamination and close doors between rooms. Also make sure that you do not use your central air system to keep airborne toxins from traveling throughout the home. During an emergency it is easy to forget the big picture. After you have made the necessary calls and secured the area, make sure that you properly document the damage with photos – and any essential notes for the insurance claim. Your insurance company should also be alerted the day of the incident. Open windows and doors to get fresh air into the home – and to aid in drying out the standing water. If sewage has leaked into your front or back yard – make sure that the neighbors are made aware of the problem. Consider making a sign or roping off the contaminated area if possible. Seek medical help immediately if direct contact has been made with the sewage. Do not attempt to clean/repair your home yourself. Make sure that you contact a reputable water/sewage restoration company with experience in all aspects of remediation. If your home is affected by a raw sewage leak, don’t panic! Follow the notes listed above – and make sure to contact the most respected mold and water remediation company in Dallas! Call RestoPros at 855-587-3786 to schedule an appointment today!